Don’t have an official digital letterhead design for your Business. Find out why you need one. Why does a Letterhead matter in Today’s Digital Era? An official letterhead for your company’s documents constructs respect and admiration for your business. The company’s letterhead is an easy way to create great first impressions. People perceive that you’re serious about your business. The letterhead reflects your brand’s identity and helps your audience connect with your brand. Above all, it prevents frauds and establishes legitimacy. A letterhead plays a significant role in your official documents. Irrespective of the size and nature of your business, an official letterhead is essential to send out advertisements, invoices, estimates, quotations, formal and legal notices. We here at WebFries, the leading digital experts in Gurgaon , help you design letterheads for all your official documents. We have an expert design team, well versed in letterhead design. Your company letterhead will include your logo, your organisation’s name, and contact details. We have a vast collection of predesigned letterhead templates. You can either choose from it or customise your letterhead design according to your specific requirements. The templates we provide will be simple and not too flashy and content the necessary fields for all the relevant information. Brand recognition is critical while designing a letterhead and so the logo is the most prominent part of the design. Don't have a logo yet, we have got you covered, as you can also design your logo with us. The colours should merge with the logo and also appeal to the audience. You should strike the right balance between flashy and subtle. We also design the colours to fit your budget as too many colours could cost you a ton while printing. We usually use minimal colours to create a clean, professional look. The font should also match with the logo. Readability is the key; we choose fonts that are easily readable and send a clear message. The quality of the paper used also affects the readability of the letterhead. We also consider the printing limitations while designing letterhead. To understand your requirements we have a questionnaire. This contains your logo, business name, contact details including business address, contact number, website, email Id and also your specifications. Your preference in font, size, colour and spacing is also acquired. We contact you via email or schedule one on one Skype calls to gather your requirements. The team understands your requirements and decides whether to customise an existing template or design your own. Additionally, you can also choose whether you want a custom letterhead or a template-based one. The designed letterhead is given to you for proofreading. We are open to any changes in design during this stage. The final letterhead is given to you along with the template. The template can be altered for future usage, and we provide you with future updates if required. 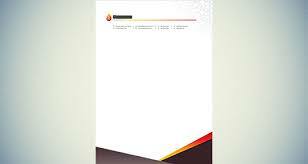 Why WebFries for letterhead design? Dedicated team: No automated processes. We have an expert graphics design team dedicated to letterhead design. They are well trained and equipped to assist you with queries and develop your ideas to create an elegant letterhead. Requirement gathering: We take time to gather all your requirements and understand which suits your business the best. Huge collection of templates: We have a vast array of templates, from which you can choose your letterhead design. The templates are well spaced and customisable according to your specifications. Professional finish: At WebFries, we understand and value the importance of your letterhead, and hence we deliver the final product which creates the best long lasting impression. The team at Webfries is a pleasure to work with in every aspect. We have been with them for last 4 years and they have designed business collaterals, website, and providing hosting and Digital Marketing services. Overall experience is simply outstanding!! Thanks Webfries Team and keep doing a great job!